German ambient alchemist Christian Doil returns to Earth Mantra with another ingenious collection of creative and curiously soothing textural ambient pieces called Maschinen. In his previous two Earth Mantra releases, Wasser and Metall, Christian presented a distinctive artistic viewpoint, a series of studies of various concrete objects. With Maschinen, he continues down his singular path through the world of ambient sound, this time delivering a set of tracks exploring the depths of the sounds of machinery. Christian's stated goal for this album was to create what he calls "microcosmic realms inside different machines", based upon recordings of the sounds of machinery around him. As is typical of his work, in Maschinen he seems fascinated with the art of manipulating field recordings, as if to see how far he can take the familiar sounds of everyday life and transform them into unrecognizable and strangely beautiful music. In this album, he took his recordings of a variety of diverse machines - an automobile, a CD player, toaster, coffee machine, camera, electric shaver, telephone, various computer equipment, and other devices - and reconstructs them, rendering astonishing textural ambient music of the highest order, creating "microcosmic spaces" that are as intriguing as they are oddly comforting. Setting aside the cleverness of Christian's method, the music itself simply delights. Christian has always demonstrated a surprising capacity for extracting the music hiding inside of the mundane sounds around us, but with Maschinen, he has really outdone himself. The music tends towards the textural, with what some might interpret as a dark ambient sound, but really there is something here for everyone. Only Christian Doil could take the sounds of a washing machine and turn it into compositionally strong and exceptionally listenable music, but with nary a melody or a hint of tonality despite the undeniable musicality of the result. Consequently, we think this album will appeal not only to fans of dark ambient, experimental music, and noise, but also to fans of more tonal forms of ambience. Truly superb work by a master of sound design and ambient composition. 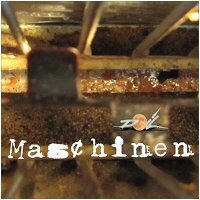 So it is with great pleasure that we unveil Maschinen, the latest work by Christian Doil and one of the best textural ambient albums we have yet heard in 2011. Highly, highly recommended. (Note that on For Getting The Air Of Floating In February 10 A, Christian is joined by C. Reider). This is a wonderful album! I'd say more, but the description is spot-on and I don't know what else to add to it. Aside from my recommendation that, if you liked this album, do check out his other works!